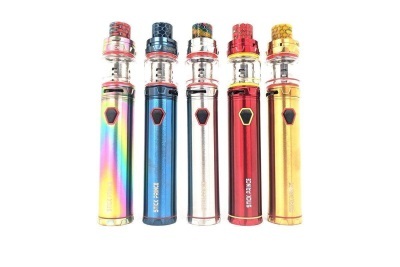 The SMOK Stick Prince Kit is a phenomenal addition to the SMOK pen-style vape system while utilizing the TFV12 Prince platform, exquisitely designed with a 3000mAh battery while retaining a staggering 8mL maximum juice capacity. The Stick Prince measures 24.5mm in base diameter and 148mm in total length, featuring a portable form factor within an expertly-crafted chassis offered in a plethora of color options. The Stick V12 Prince is charged via microUSB port, with intelligent battery indicators and intelligent blinking LED lights for the 3000mAh enclosed battery. Operationally, the Stick Prince implements a single button firing mechanism to enable a "smart" mechanical method, in which output power correlates to the current state of battery, with a range of 3.4V to 4.2V while implementing multitudes of safety protection. Paired with the Stick Prince the powerful TFV12 Prince Tank, featuring a maximum capacity of 8 milliliters, new button-lock hinged top-fill, smooth dual bottom airflow control, and the versatile TFV12 Prince Coil System. Also included in the kit is a pair of the 0.17 Prince-M4 Coils catering to this impressive kit.